Friday, I went to the little town east of here to have lunch with a friend. After lunch, we visited some of the flea markets. And yes, there it was and remarkably it was 33% off for they were having an after Christmas sale! Sometimes, I guess, it pays to wait!!! 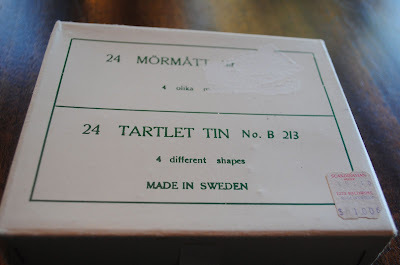 A box of "tartlet tin", 4 different shapes and Made in Sweden . . . . .
And inside -- four little tartlet tins, never used. I didn't get them originally because I have some -- I've used them to make pastry crusts for tea tarlets. Bought without a box ages and ages ago. I reasoned that I didn't need more even if they were in their own little box! 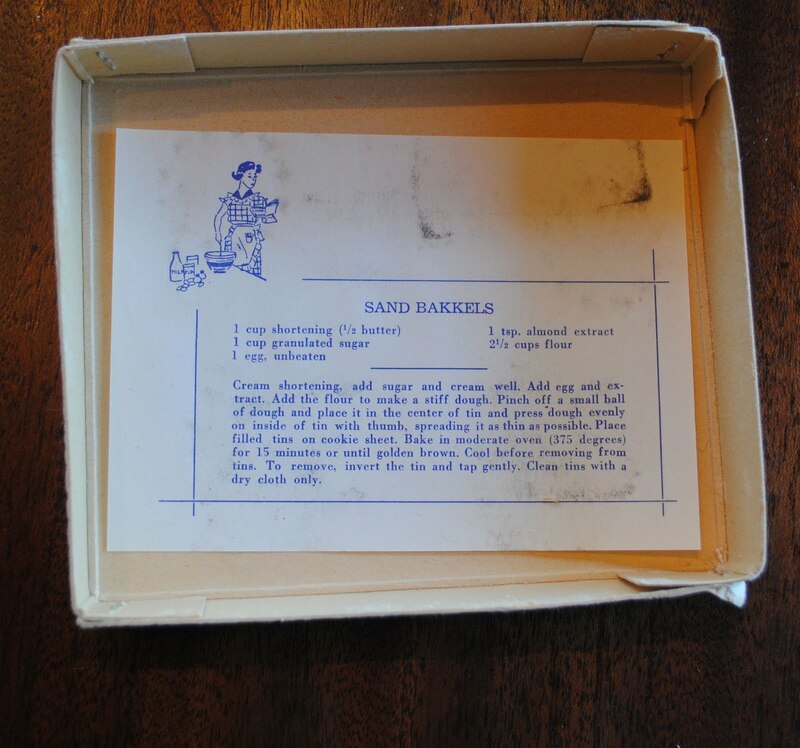 But under the tins was this recipe for Sand Bakkels. Which I've never heard of but seemed simple enough. 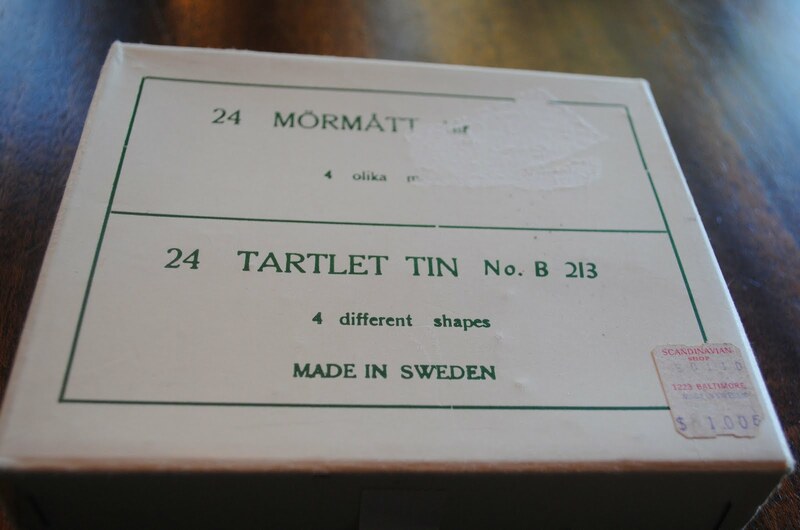 The directions, however, had me confused as to whether or not they were to be filled after baking -- the outside of the box DID say "tartlet tins"! And so to the internet, where I found out that they were really Norwegian cookies, they were baked in these molds and they were not filled! Mostly baked at Christmas time, it seems. But, why, I wonder were my little molds Made in Sweden? The recipe is easy and goes together quickly and soon I had a cookie sheet full of dough in these little molds. And they unmolded very easily -- I love the little shapes and although they do really look like cakes in the picture, they are cookies -- a buttery almond flavored cookie. Similar in taste, I think, to an almond shortbread. Today, it is snowing on the prairie -- our first real snow of the 2010/2011 winter. Big fat flakes are falling and what better day to stay inside (and continue with house cleaning). 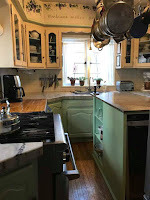 But cleaning can't go on forever and so when the grandfather clock in the living room strikes quarter past three, I stop and put the kettle on. For every afternoon at half past three, it's time for tea and a nosh. 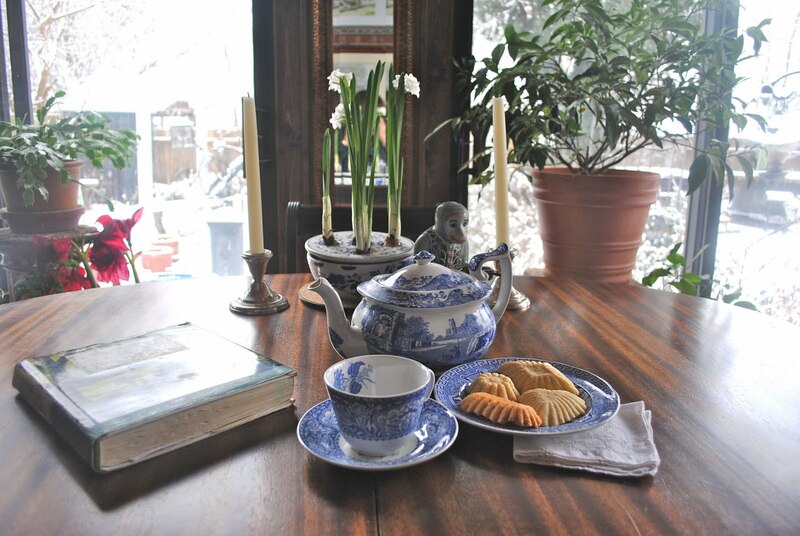 At the breakfast room table, with a cookbook (I'm looking for recipes for a luncheon I'm giving on the 18th), watching the snow falling, sipping tea and nibbling on the Sand Bakkels. They are a bit of a trouble but I like shortbread type cookies and these are really fantastic! And I love their shapes! And they go so well with tea (or with coffee). It's more of a celebratory tea so I'm using a Spode pot and cup and saucer and plate. 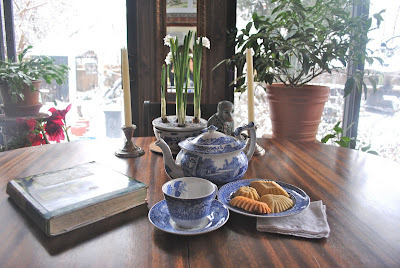 It's a celebratory tea because it's finally snowing and the garden is always so pretty in the snow!!! Much needed moisture for the plants and more of our feathered friends come to the feeders and bird bath because of the snow! Such pretty cookies and they do look delicious! I love your blue and white tea set; such a lovely pattern! We have plenty of snow here which we got over the weekend. Winter has come here in eastern Canada and I'm looking forward to Springtime now! Thank you for sharing and for joining me for tea. Your little tartlet tins are really pretty Martha, and the Sand Bakkels look delicious...I love the fact that everythings stops for tea each day. You know I'm crazy about blue and white - so the Spode gets a thumbs up from me too! Martha, those cookies look delicious. If I am every on your street in the afternoon I will certainly be knocking on the door. 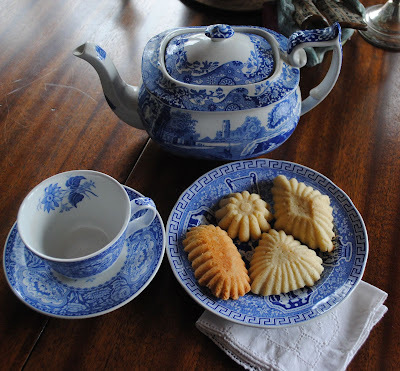 The spode teapot and cup are lovely. Enjoy you tea and stay warm. Sounds like you had quite a lovely day!! Martha, Your cookies are so pretty and I really enjoyed seeing your blue and white tea set. Very pretty! 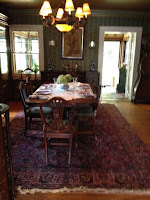 You are a great hostess, Martha,and I do so enjoy visiting. Very interesting to hear about your sand bakkels and they look delicious. I like your beautiful blue and white tea set too. What a pleasant find! 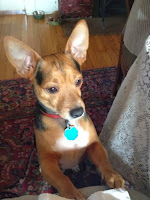 I adore that you took the time to look up the history and share with us! Enjoy the Sand Bakkels of your labors! I'm enjoying the SNOW on my end of the prairie! Those are such pretty cookies. I wonder if the recipe would work in a Madeleine tin. I think I'll give it a try. Hi Martha! Oh, these little pans are so cute and look at the wonderful goodies you've made with them. Your tea setting is gorgeous as always. As soon as I saw your tins I gasped, "Oh! I have the same Sandbakkels tins!" And sure enough, I kept reading and there it was -- the inside lid of the box with the recipe in it! My tins were my mothers, and I believe my grandmothers before her but I can't say that for sure. Mama made them at Christmastime, and it was a treat for us children to have them, as they were usually meant for company -- it's not easy to make lovely thin Sandbakkels and then see them go down the hatches of 4 hungry kids! 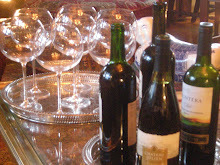 For family they were served plain -- but "empty" side up, not bottoms up. For company, they would be filled. Sometimes a thick sweetened whipped cream piped in -- Norwegians love whipped cream with their tea or coffee offerings -- or they would be filled with sliced strawberries, or raspberries or a bit of lingonberry jam, with a dollop of (you guessed it) whipped cream. Served that way they are beyond heavenly! My mother didn't like almond extract (although she loved marzipan, go figure), so ours skipped that and used a bit of vanilla instead. What fun to see your Sandbakkels tins. They are lovely cookies. GREAT thrift find, that's for sure! pretty and useful find are those tartlet forms. I have such also and I use to bake salty crusts and tube on the surface creamcheese. That is a nice addtion for buffets. But your tartlets look really yummy and Almond sound good. That was a delightful teatime. Have a good time. 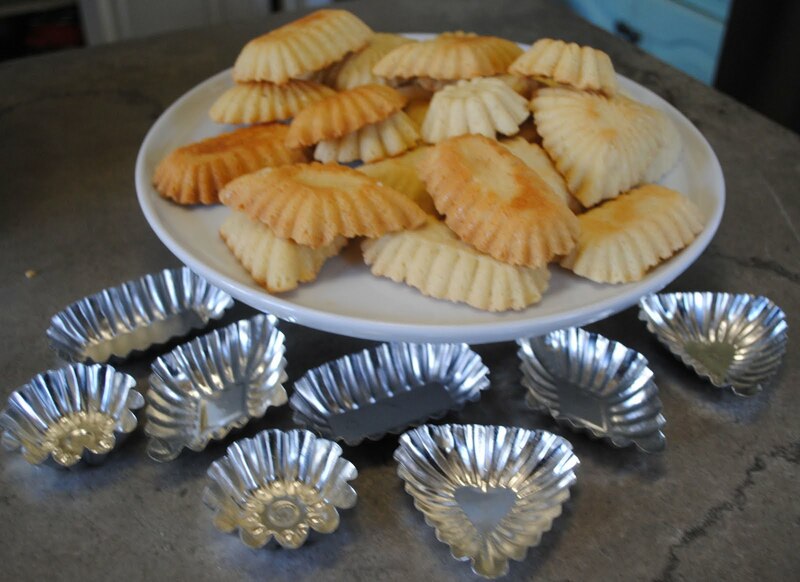 Your Spode tea set is lovely and really is pretty on the table with your new tartlet cookies! 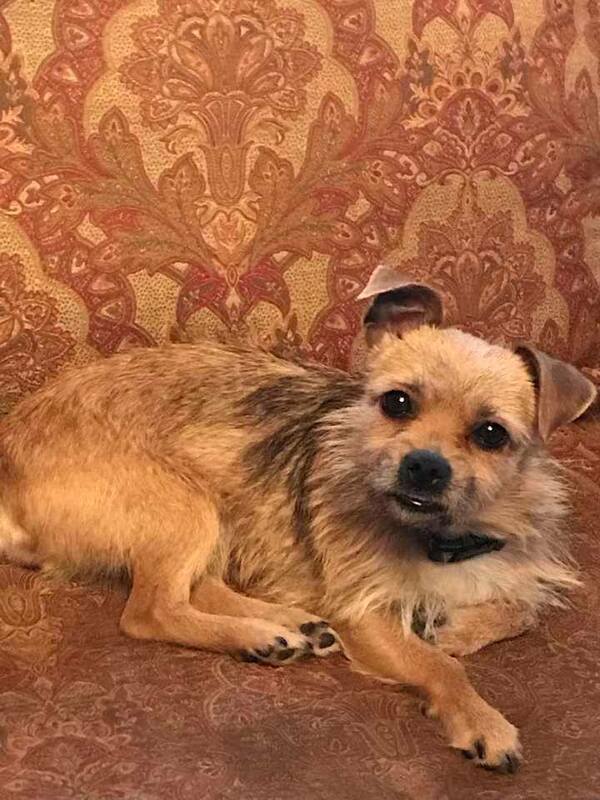 Wonderful and fun find for you. Happy Tea Day! 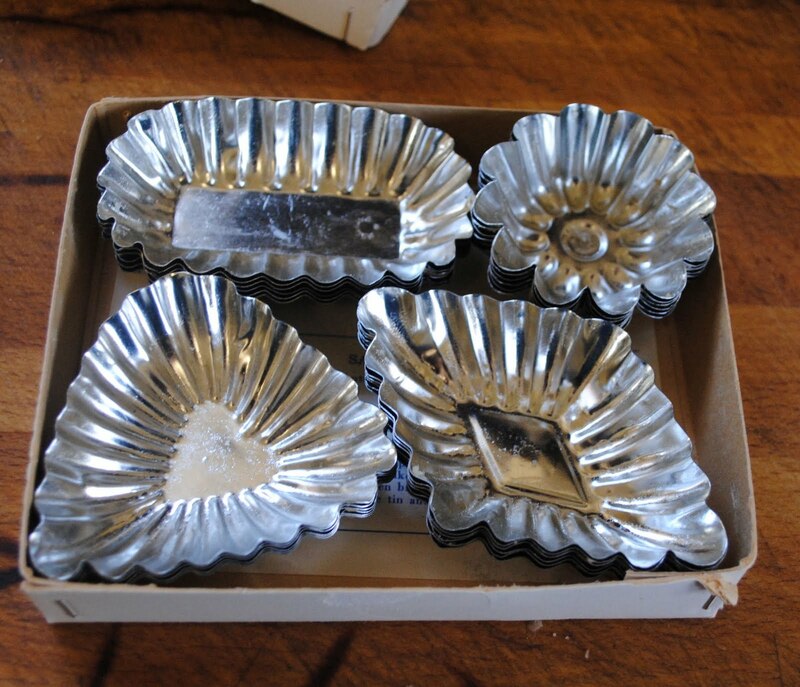 I have those same molds (bought loose) and have only used them for tarts. I love the charming shapes of your sand bakkels. I might have to pull those molds out and do my own. What a lovely tea setting especially with those gorgeous cookies. Enjoy. So pretty!! Thank you for stopping by and visiting me, hope to see you again! Thanks so much for joining me once again for tea!